Leonard D. Simmons Jr. (fourth from left), board chair of the Renaissance Neighborhood Development Corporation, cuts the ribbon Thursday morning at the opening ceremony for the Bayou Cane Apartments in Houma. 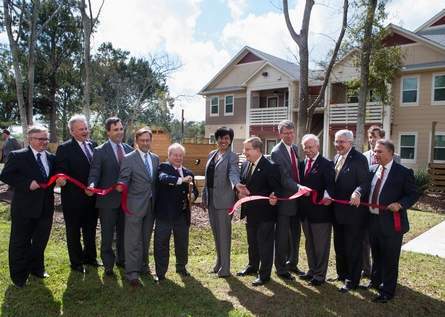 Officials commemorated the opening of an affordable-rent apartment complex in Bayou Cane for lower- and middle-income families with a ribbon cutting ceremony today. The Terrebonne Parish Council approved the use of $5.7 million in Community Development Block Grant money in July 2013 and the project was awarded to Renaissance Neighborhood Development Corp., a subsidiary of Volunteers of America. The remainder of the $13.5 million project will be covered by tax credits. Terrebonne Parish President Michel Claudet said the apartment market has changed because of the decrease in oil prices but housing is still needed. “You will never have enough affordable, workforce housing in this parish. We know that time and time again,” he said. Sixty percent of the units are workforce housing for residents making less than 80 percent of the area’s median income, officials said. There are caps on the rent in the workforce housing units, but the rates will fluctuate each year, officials said. The first building of the development was opened in June, Victor Smeltz, executive director of the Renaissance Neighborhood Development Corporation, said. Since then, 92 percent of the units have been rented out showing the need for affordable workforce housing in the parish. “We’d be delighted if we would be able to continue that in this community as well as others,” Smeltz said. One of the aspects of Bayou Cane that makes it special, Michelle Thomas, interim executive director of the Louisiana Housing Corporation, said, is that it is a mixed income community.